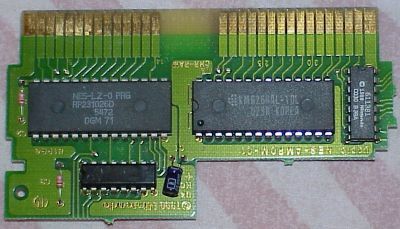 A discrete logic Nintendo-made board. Max 128K of PRG ROM, a 74161, and an 8K VRAM. Note: this board has bus conflicts. The LS161 acts as a latch. It latches D0,D1, and D4. Writing anywhere in the 8000h- FFFFh range will set this latch using the above data lines. The B bits select a 32K PRG ROM page at 8000-FFFFh. The M bit is sorta odd. It selects which nametable is to be displayed. display the same nametable. (The nametable is chosen via the M bit). All HTML and graphics designed and copyright by Kevin Horton.